The Alien Queen has nothing on the comic 'event' books of old. They would spawn a multitude of "crucial" tie-ins, the logo would burn itself with acid like resolve into every cover on offer for months on end, and fan wallets were often massacred as a result. Now as a rolling effect of epics like The Sinestro Corps War, publishers on all sides, are aiming to make event books relevant to a fraction of their range only. Leaving the number of titles involved, the key issue in fan affordability of major events, in these tight economic times. 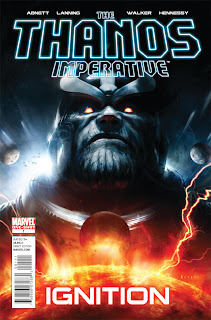 That's why Marvel gets the big thumbs up for actually putting related books Nova and The Guardians of the Galaxy on hold, while their latest cosmic blockbuster; The Thanos Imperative hits, despite both books been highly-unsung and deserving of bigger sales. that is an amazing cover...WOW! It sure is a piece of work ain't it? The hollow font, and just that big ominous head make it look like some retro-cool Sci-Fi movie poster. 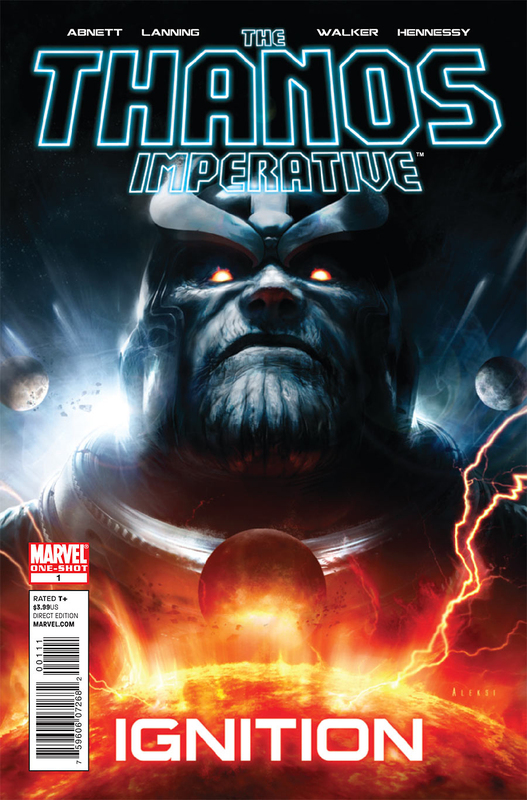 Somehow I think Marvel has just fond their next Dell'Otto / Djurdjevic.